Cut apart, slammed to the ground, and brought to America by a man as outrageous as it is, this rat rod Lambo is sure to split opinions. Customized Lamborghinis aren't all that rare. Tap a few letters into Google, and you'll come up with all sorts of Raging Bulls wearing outrageous body kits, clad in colors bright enough to make Ray Charles take notice, or rolling around on oversized wheels of dubious provenance. 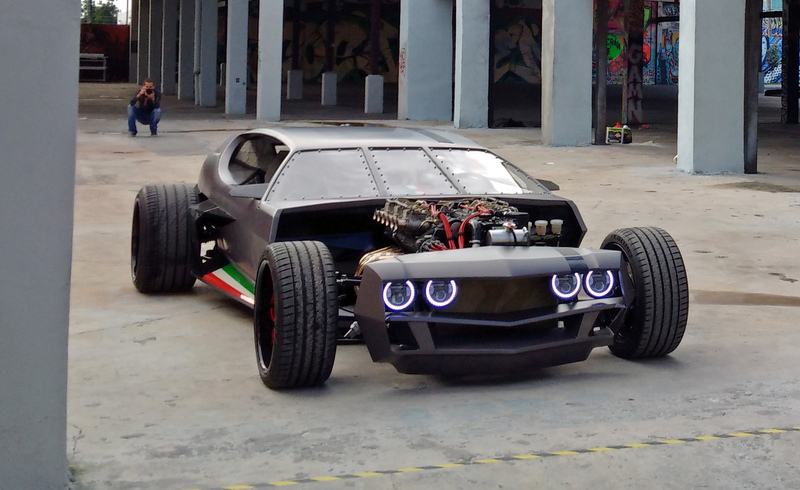 Odds are good, though, that you've never seen a custom Lambo quite like this Lamborghini Espada rat rod. It's almost as wild as the man responsible for bringing it to America: a 48-year-old man whose passport records his legal name as "XXXX Elo," according to his personal assistant (slash wife). Colloquially, however, he leaves off the Layer Cake-style affectation at the front. “I’m known as the Mad Collector. I hate to talk about myself, but when you see my collection, you’ll fall over and die,” Elo says. The custom Espada, seen here with an Alexandre Danton-made Porsche 911 rat rod. The project, according to a statement issued by Hervé, was kick-started last year after he bought a 1968 Lamborghini Espada and decided to turn it over to Danton, giving the craftsman "free reign" to design something to celebrate the car's 50 years on Earth. The resulting vehicle sits roughly eight feet wide—“Alexander Danton’s trademark is, all the wheels come out,” Elo says—and boasts an angular matte black body that brings to mind the likes of the Sesto Elemento concept car. Like the original, however, it still boasts a V-12 up front—and still has four seats. Another details that sets the rat rod Espada apart from your garden variety custom Lambo: This particular car was crafted with input from Fabio Lamborghini, Ferrucio's nephew. According to Elo, Fabio says the fabled tinkerer and builder Ferrucio would have been very much into the wild work done to his five-decade-old gran turismo. "First thing he said was, if [my uncle] was here, he would have approved,” Elo says. Not that Signore Lamborghini was always keen on the artist's plan for his uncle's four-seater. Lamborghini: "Why don’t you have windows?" Elo: "Rat rods don’t have windows." Lamborghini: "The lights are too modern!" Nevertheless, according to Elo, Fabio came around on the car in time—as the U.K.-born Florida resident expects other Europeans will, should the style become more popular in the customization-friendly United States. 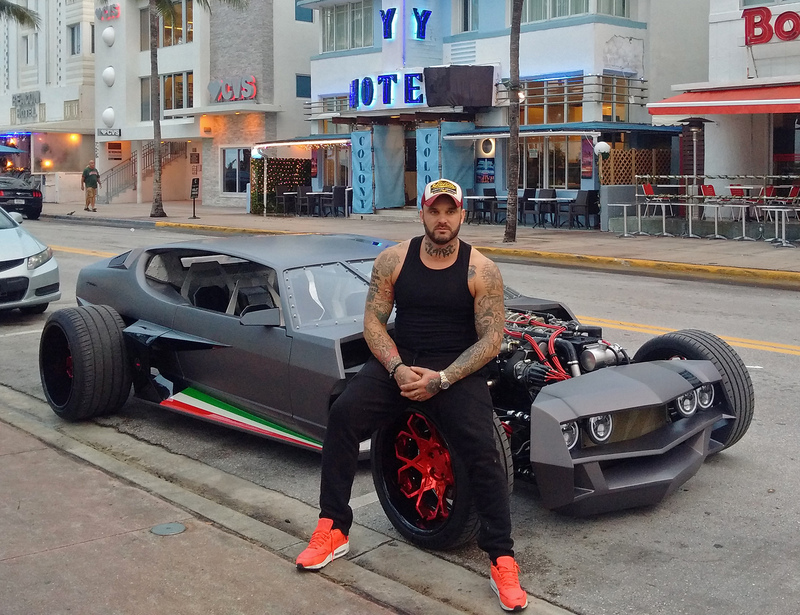 But the car will stay in Miami for the next couple months, Elo says, where even locals attuned to exotics and custom cars have taken notice.